Even after acknowledging its fading fanbase, boxing will go down as one of the most popular sports of all time. It is a grueling contest that welcomes people of all shapes and sizes, but it is debatable a certain group of people have revolutionized the sport more than any other. Latinos have been putting on exciting contests in the ring for decades dating back to Kid Azteca in the 1930s. They are still a prominent part of combat sports today and men like Juan Manuel Marquez are reminding us of that. Now, UFC co-founder Campbell McLaren and Combate Americas are looking to introduce a new generation of latino warriors to revolutionize the sport of mixed martial arts. 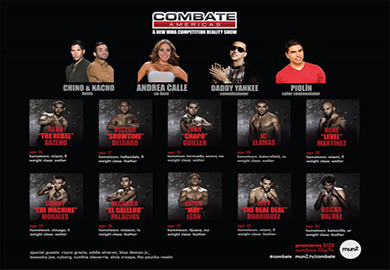 Combate Americas is a new mixed martial arts reality series that is set to debut this Sunday, February 23rd, on mun2. 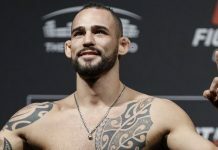 Latino welterweights and featherweights will be duking it out to see who in their respective divisions will be the first to earn a contract for Combate Americas. 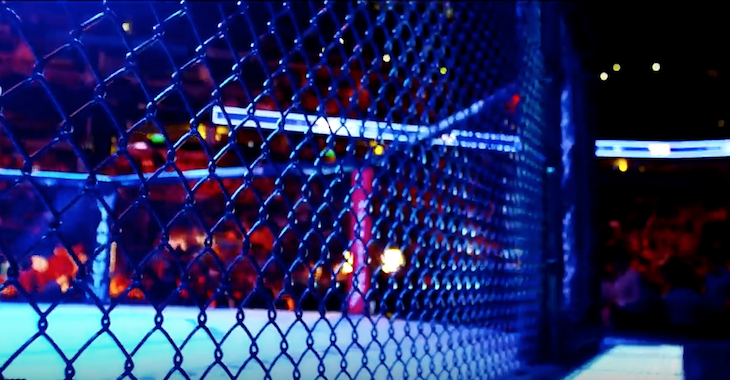 The series will provide viewers an in-depth look of who the fighters are, where they come from, and what led them to a career inside the cage. That was not the fault of a young Danny Morales, though, as most individuals were not aware of MMA in the early 90s. Campbell McLaren was busy trying to raise awareness about the sport by creating an event that would introduce thousands to the spectacle that is MMA; An event that was simply dubbed ‘Ultimate Fighting Championship’. With guys like Campbell McLaren behind the scenes and athletes like Royce Gracie performing their hearts out, it was assumed MMA would take off like it has. Fast forward twenty years and pioneers like McLaren and Gracie are mentoring undefeated prospects like Danny Morales in Combate Americas. Despite Combate Americas putting on a reality show and future fight-cards, Campbell McLaren has made it clear that this is not a call for competition with other promotions. Besides putting on an entertaining product, the purpose of Combate Americas is to introduce the exciting sport of MMA to a group of potential fans that may not know a lot about it. While Danny Morales may be destined for greatness and a champion in the future, Combates Americas will have established MMA icons like Royce Gracie and champion Eddie Alvarez appear throughout the season to inspire the fighters and teach new viewers who the stars of the sport are. The show will also see appearances from pop-culture icons such as pro wrestler Blue Demon and Psycho Realm. Reggaeton star Daddy Yankee will serve as the commissioner of Combate Americas and despite being a musician, he is not completely out of his element. Morales mentioned, “He fit right in. He was a very humble guy. He’s a hard worker for sure.” It isn’t surprising that Yankee took so fast to the sport considering he aspired to be a boxer when he was younger. The new reality series is set to air on mun2, a network that McLaren is excited to partner up with. McLaren elaborated, “Mun2 is literally perfect for this. It’s a bi-lingual network. When Royce Gracie is on the show, Royce speaks English. When Blue Demon comes on, he speaks Spanish. I like that everyone speaks the language they speak.” Those who do not speak Spanish should not worry as there will be English subtitles when necessary. “The Spanish is going to be subtitled. My Spanish is really, really not strong so I am glad to have the subtitles.” McLaren joked. The contestants on Combate Americas have something to prove to the world. Even though they may be lesser known than fighters you see in Bellator and UFC, they have just as much potential— if not more. Combate Americas is set to air on mun2 this Sunday, February 23rd, at 10:00 PM ET.